If you’re reading Marvel comics right now, then you’re probably aware that while Steve Rogers has taken up the Captain America mantle once more, something is... very off. Like, “he’s secretly a fascist agent of Hydra planning to get space aliens to invade the world” off. Confused? We’re here to get you caught up on “Stevil” Rogers. To understand the heel-turn of Steve Rogers from First Avenger to Agent of Hydra, we actually have to go back a few years before the infamous first issue of Steve Rogers: Captain America from May last year. In 2014's Captain America #21, Steve faced one of the biggest events in his long career as Captain America: a mysterious villain called the Iron Nail drained Steve of the Super Soldier Serum that had imbued him with his powers all the way back in World War II. The horrifying attack didn’t kill Steve—the loss of the serum simply robbed him of his powers, and returned him to his natural age. But Captain America was at an end—until a few issues later, in which Steve decided that not only did the world need a new Captain America, only his long time comrade Sam Wilson (better known as the Falcon) should take on the mantle. For a few years, that status quo was maintained. Sam went on his own adventures as Cap, and the elderly Steve, still a respected member of the superhero community, continued to serve from administrative and off-field positions, whether through SHIELD or with leading initiatives like the Avengers Unity squad. Then, during last year’s Avengers: Standoff mini-event, we got a big step forward to bringing Steve Rogers back into the superhero fold. Standoff revolved around SHIELD, as it always does, being full of itself only to have its confidence promptly blow up in its face. After a series of whistleblowing leaks outed a Maria-Hill-approved plan to use reality-altering Cosmic Cubes to tweak the fabric of existence, SHIELD is forced to dispose of whatever fragments of cosmic cubes they have... except they don’t, because they’re SHIELD. They’re reckless idiots. The fragments SHIELD kept ended up forming into an entirely new being: Kobik, a young girl unaware of many her vast powers as a creation born from the Cosmic Cubes.. SHIELD suddenly couldn’t get rid of Kobik, so they decided the best use of her was to essentially lock her up and use her powers to create a bizarre new supervillain prison called Pleasant Hill, a quaint little slice of Americana that wipes the mind of its prisoners and reforged them as humble citizens of the town. Naturally, things went very wrong, very fast, leading to Steve and the various teams of Avengers stepping in to shut the facility down. During that fight, Old Man Rogers found himself near death at the hands of his long-time foe Crossbones—but before Crossbones could kill him, Kobik intervened, not just saving Steve but altering reality enough to return him to the young, superpowered Captain America once more. All’s well that ends well, right? Well, wrong. As it would be eventually revealed, during her time in Pleasant hill, the young Kobik was being influenced by the real master behind everything: the Red Skull. Through fellow Hydra agent Erik Selvig, it was Skull who planted the seeds of Pleasant Hill within SHIELD’s minds (although they agreed it without any knowledge of Red Skull’s plans, obviously). Kobik grew attached to Red Skull, who told her of the glory days of Hydra, and then gave her a mission: use her powers not just to restore Steve Rogers to glory, but to alter his past to make him a lifelong Hydra sleeper agent just waiting to be activated. All the memories we saw in Steve Rogers: Captain America #1 aren’t exactly real: they were the memories Kobik created for Steve. But for all intents and purposes, they’re real to him. Steve Rogers isn’t brainwashed. His memory isn’t wiped. As far as he knows, as far as he ever knows, he’s been a member of Hydra ever since he was a little kid, recruited into the agency through a mysterious woman who befriended Steve’s mother back before the Second World War. But while Red Skull has got his wish to turn his biggest foe into his greatest ally, not everything is that simple. While Red Skull has been reforging Hydra for the modern age, Steve sees himself as the banner-holder for an even purer version of the organization, secretly working with Selvig behind the Red Skull’s back to replace—perhaps even kill—him and bring Hydra into the light as the true rulers of the world. The way Steve has been working towards that goal has pretty much brought him into the realm of full-on supervillainy. Although still actively part of the superhero community for now, Steve began undermining his heroic colleagues—stoking the dissent between Carol Danvers and Tony Stark that would eventually lead to the events of Civil War II, demoralizing the hero community and leaving public faith in superheroes at an all time low. The aftermath of the event saw Steve drafted in as the defacto head of SHIELD, and in an unprecedented move, given the ability to use the organization for far-reaching, dystopian levels of surveillance and control. Which is pretty handy, as in his free time as a Hydra agent, Steve is currently planning an invasion of Earth. By aliens. Specifically, the Chitauri, by growing one of their queens on Earth in an attempt to attract the alien’s hive minds to her location. His plan is to eradicate a good chunk of the Earth’s population, allowing him and Hydra to swoop in, rebuild, and reforge the world as willing slaves to Steve’s new vision. It’s pretty messed up stuff for a figure that is moral bedrock of the Marvel universe—and at a time when the symbol Steve Rogers represents is needed desperately, the portrayal of him as a fascist figure has been an enduring source of controversy. 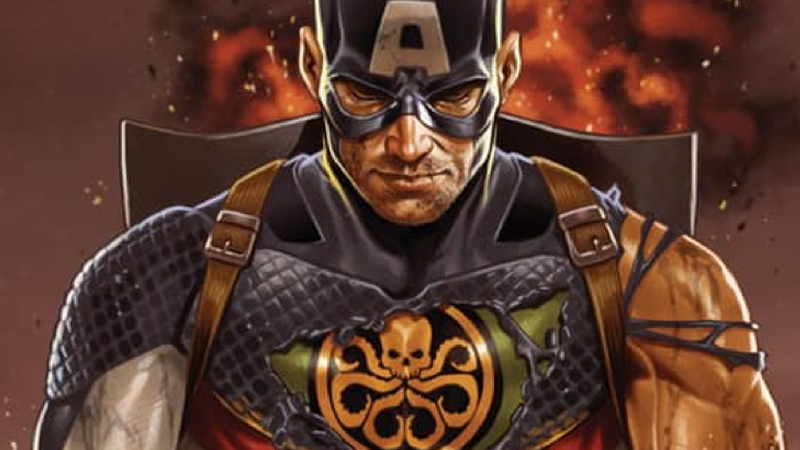 But everything is going to come to a head soon enough—Marvel has confirmed its next major event, Secret Empire, will expose Steve as Hydra’s mastermind and his dastardly plans will be enacted. Whether he’ll succeed, or be stopped and reverted to his former self, we’ve yet to see. Civil War II’s prophetic Inhuman Ulysses even teased that Steve could face death (again), at the hands of Ultimate Spider-Man Miles Morales, during the event. But either way it’s been a long, weird journey for Steve Rogers this past year—a journey that is far from over.